Willow Row lies in the centre of Derby, and is a key pedestrian and cycle route. In keeping with the name of the road and the Willow tree’s association with regeneration, Derby City Council wanted the new lighting scheme to have an organic form. 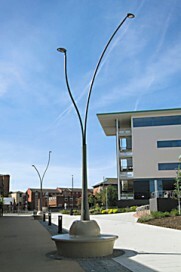 Urbis supplied eight Thylia luminaires, mounted on four double columns. Each central steel column rises up from the stone base and branches into two curved arms.